The Battle took place between a Spanish fleet commanded by Don Juan Alonso de Idiáquez y Robles and a Dutch fleet led by Artus Gijsels during the Eighty Years' War. Four Dutch ships were destroyed and the rest seriously damaged. Seeing the tactical superiority of the Spanish fleet, the Dutch decided to retreat. The Spanish officers tried to persuade Idiáquez to pursue the enemy fleet and finish them off entirely, but he preferred to return to Cádiz. In 1641, after the outbreak of the Portuguese Restoration War, the Portuguese government, with Dutch and French help, prepared to start the offensive against Spain at sea. Dom António Telles da Silva, who had fought the Dutch in India, was designated commander of squadron of 16 ships, which along of another 30 of the Dutch Republic under Artus Gijsels, was entrusted the mission of capture and hold the Spanish towns of Cádiz and Sanlúcar. The attempts failed thanks to the fortuitous encounter that they had with 5 Dunkirkers under Judocus Peeters, who was chasing a flotilla of Algerian privateers, off Cape St. Vincent. Peeters managed to reach Cádiz without losing a single vessel and put on alert the Marquis of Ayamonte and Don Gaspar Alfonso Pérez de Guzmán, 9th Duke of Medina Sidonia. Gijsels and Telles returned to Lisbon, where Telles was replaced by Tristão de Mendonça, former Ambassador to the Dutch Republic. The Portuguese fleet then sailed with the French fleet of the Marquis de Brézé, while the Dutch fleet set sail in order to intercept and capture the Spanish West Indies Fleet between the Azores and Cape St. Vincent. It was a hasty maneuver, since the Dutch ships had orders to return to their country if the West Indies Fleet didn't appear before November. The Spanish squadron of Galicia, under Don Andrés de Castro, the squadron of Naples, under Don Martín Carlos de Meneos, and the galleons of Don Pedro de Ursúa, were urgently gathered in Cádiz to intercept the Dutch fleet. The military governor of Cádiz, Don Juan Alonso de Idiáquez y Robles, Duke of Ciudad Real, was appointed commander of the fleet in substitution of the Captain General, the Duke of Maqueda, who was ill. He was a veteran soldier, having seen action in the Siege of Leucata against the French, but was unexperienced in sea battles.Gijsels fleet was sighted off Cape St. Vincent. The Duke of Ciudad Real immediately ordered to attack the major Dutch vessels, sinking three of them, destroying another one, and causing considerable damage to the remaining. Inexplicably, when his ships were approaching the defenseless Dutch warships to board them, he stopped the attack and ordered to return to Cádiz. This conduct dissatisfied King Philip IV, who severely reprimanded, among other officers, Don Martín Carlos de Mencos, Admiral Don Pedro de Ursúa, and Captains Pedro Girón, Gaspar de Campos and Adrián Pulido. According to Dutch sources, the battle was indecisive, and broken off when the Spanish disengaged and returned to Cádiz. Dutch casualties were 100-200 killed and 2 ships lost, while Spanish losses were possibly 1,100 killed and 2 ships lost. Michiel de Ruyter was present at this battle as Rear Admiral of the Dutch fleet. The Dutch ships under Artus Gijsels, abandoned by their Portuguese and French allies, sailed back to England to make repairs.The outcome of the battle had no impact on the course of the Portuguese revolution. The action of 18 February 1639 was a naval battle of the Eighty Years' War fought off Dunkirk between a Dutch fleet under the command of Admiral Maarten Tromp and the Spanish Dunkirk Squadron under Miguel de Horna. Horna, who had orders to join with his ships Admiral Antonio de Oquendo's fleet at A Coruña, escorted at the same time a transport convoy carrying 2,000 Walloon soldiers to Spain, where they were needed. The attempt to exit Dunkirk was done at the sight of the Dutch blockading squadron of Maarten Tromp. Then a 4-hour battle ensued and Horna was forced to retreat into Dunkirk leaving behind two of his galleons, while another one ran aground. Despite his success in stopping the sortie, many of Tromp's ships suffered heavy damage, and the Dutch Admiral was forced to abandon the blockade. Therefore De Horna, after repairing his squadron, was able to accomplish his mission. By 1639 the Spanish naval situation in the war against the Dutch Republic had worsened. Most of the Armada del Mar Océano had been attached to the Armada de Pernambuco under don Fernando de Mascarenhas, and the Treasure fleets were blocked by Cornelis Jol's privateer ships of the Dutch West India Company at Havana and Veracruz. The French entrance in the war had cost Spain its northern fleet, destroyed by a larger French fleet under Henri d'Escoubleau de Sourdis at the Battle of Guetaria, where the Basque shipyards were disabled Only 20 galleons commanded by Antonio de Oquendo were still on the warpath. In January 1639 the Count-Duke of Olivares ordered a great fleet to be gathered at the Galician port of A Coruña with the aim of carrying troops and money to the Spanish Netherlands Admiral Antonio de Oquendo was given the command of this fleet. As the French and Dutch armies had blocked the Spanish Road, Spain's main route by land, the reinforcements could only be sent by sea. Following the orders of Olivares, the Spanish Squadron of Dunkirk, under the Navarrese Admiral Miguel de Horna, prepared to join Oquendo at A Coruña. The recently recruited Walloon Tercio of the Baron of Molinguen, whose strength was about 2,000 men, was embarked aboard the Dunkirk Squadron in order to be transported to Spain to face an imminent French attack in the north of the country. Once the States-General received news of these activities, Admiral Maarten Tromp was ordered to prevent the departure of the Dunkirkers in command of 12 warships, appearing off Dunkirk on 17 February. The Marquis of Fuentes, military governor of the town, categorically ordered Miguel de Horna to sail without delay, not fearing the Dutch squadron because of its smaller strength. The Spanish convoy, consisting of 12 galleons, 3 pinnaces and 5 transports, departed the port at dawn on 18 February via a southern outlet called Het Scheurtje (The Little Fisure). According to contemporary Spanish accounts, a large number of Horna's ships ran aground at Mardyck, and the Admiral found himself alone with only 6 galleons and 2 frigates. At the same time that the Spanish squadron sailed out the Splinter off Mardyck at 8 PM with very little wind, Tromp's 12 vessels were anchored in the Dunkirk Roads. They set sail and ran westwards between the brakes and the Splinter, intercepting the Spanish squadron between Mardyck and Gravelines. As soon as both fleets came within firing range of each other, a furious battle began that lasted 4 hours. Tromp's flagship Amelia was damaged and the Dutch Admiral was forced twice to careen and plug its leaks. As none of the winds was shifting westerly his vessels, Horna bore down towards the Fort of Mardyck in a smooth water searching the protection of its guns. Tromp followed him and engaged the vice-flagship of Dunkirk, which had lost the use of its steerage and had its rudder-head shot, being finally ran aground upon the western tail of the Splinter, where its crew set it on fire after salvaging some of the provisions that it had aboard.The galleons under Captains Mény and Petit, of 34 guns each, were captured, and De Horna was forced to retire. The casualties suffered by his fleet were estimated by the Dutch to be 1,600 men killed or wounded, and reported as 400 from all causes in the Spanish accounts. About 250 prisoners were taken aboard the two captured galleons. The Marquis of Fuentes was blamed for the failure but imprisoned De Horna and his Vice-Admiral Matthys Rombout after the action, although he soon restored them to their posts. In less than a month the squadron was repaired, re-equipped and re-manned and put to the sea again, and Horna set sail from Dunkirk on 12 March. The port was then no longer blockaded and the squadron reached A Coruña safely having captured some commercial vessels. Tromp, meanwhile, had been honored, as well as his captains, with gold chains and medals and fair words. Unlike the Spanish, however, he could not repair his ships, and when he set sail on 15 March, too late to stop De Horna, he did it only in command of 4 ships. De Horna, strategically if not tactically, had accomplished his mission. while Tromp's 2-year blockade of Dunkirk had failed to prevent the Spanish ships from continuing to undertake their activities. De Horna added seven galleons to Oquendo's fleet: San José, San Vicente, San Gedeón, Salvador, San Juan Evangelista, San Martín and San Carlos. The Battle off Lizard Point was a naval action which took place on 18 February 1637 off the coast of Cornwall, England, during the Eighty Years' War. The Spanish Admiral Miguel de Horna, commander of the Armada of Flanders, intercepted an important Anglo-Dutch merchant convoy of 44 vessels escorted by 6 warships, destroying or capturing 20 of them, and returned safely to his base in Dunkirk. In early 1636, the experienced Flemish Admiral Jacob Collaert, commander of the Armada of Flanders, was defeated by five warships of the Dutch blocking fleet under Captain Johan Evertsen. His galleon and another vessel were sunk after a prolonged engagement off the French coast, near Dieppe, and he was captured along with 200 of his men. After an exchange of prisoners he was freed, but died of an illness at A Coruña shortly after. The Navarrese Miguel de Horna replaced him. Horna also proved to be a skillful commander, as he destroyed three major enemy convoys in less than two years, winning the actions of the Lizard, Mardyck and the Channel. Horna returned to Dunkirk escorting 17 prizes fully loaded with ammunitions and supplies. 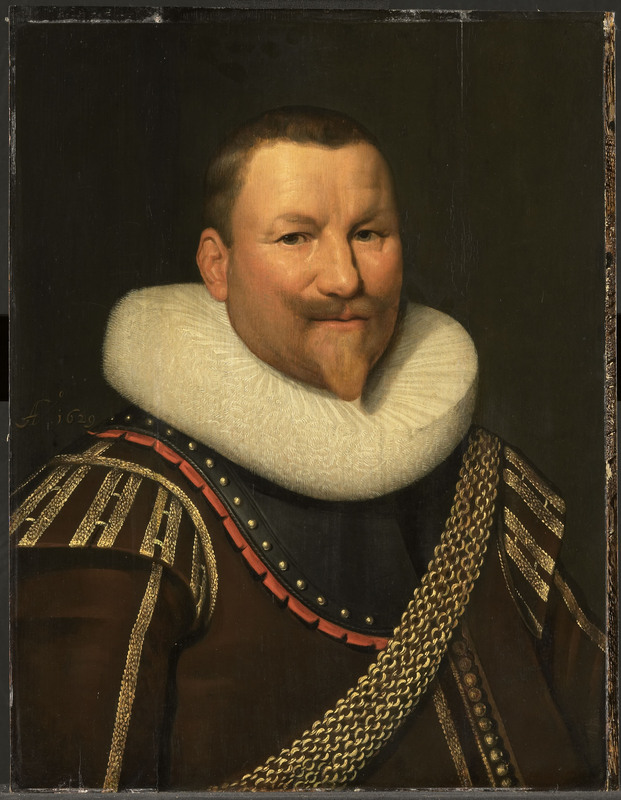 He avoided the Dutch Admiral Philips van Dorp, who had been sent to intercept with 20 warships. Van Dorp blocked the Spanish fleet in the port, but also failed, as Horna was able to continue his campaigns without difficulties. In July he ambushed two Dutch Bordeaux convoys, carrying off 12 prizes loaded with, amongst other items, 125 valuable cavalry horses. The convoy coming from Venice to Amsterdam was also captured, as well as 14 ships of the Dutch East India Company and 8 which carried gifts to Louis XIII of France. 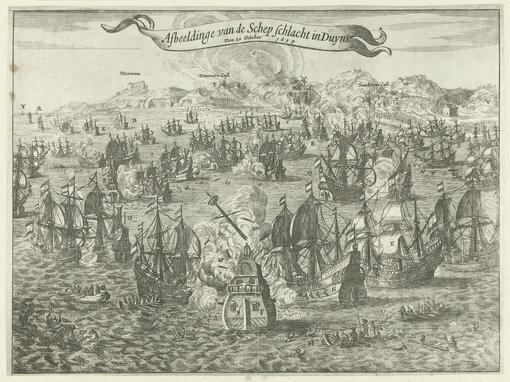 A later exploit, the action of 18 February 1639, when he was attacked by a Dutch fleet of 17 ships, resulted in another victory for Horna, despite his numerical inferiority. 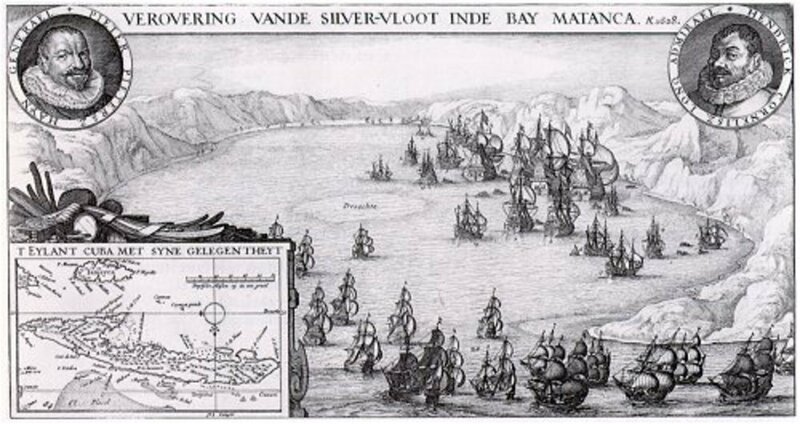 The Battle in the Bay of Matanzas was a naval battle during the Eighty Years' War in which a Dutch squadron was able to defeat and capture a Spanish treasure fleet. In 1628, Admiral Piet Hein, with Witte de With as his flag captain, sailed out to capture the Spanish treasure fleet loaded with silver from their American colonies. With him was Admiral Hendrick Lonck, and he was later joined by a squadron of Vice-Admiral Joost Banckert. Part of the Spanish fleet in Venezuela had been warned because a Dutch cabin boy had lost his way on Blanquilla and was captured, betraying the plan, but the other half from Mexico continued its voyage, unaware of the threat. Sixteen Spanish ships were intercepted: one galleon was taken after a surprise encounter during the night, nine smaller merchants were talked into surrendering; two small ships were overtaken at sea, and four fleeing galleons were trapped on the Cuban coast in the Bay of Matanzas. After some musket volleys from Dutch sloops, these ships surrendered also. Altogether, Hein captured 11,509,524 guilders of booty in gold, silver and expensive trade goods, such as indigo and cochineal, without any bloodshed. The Dutch didn't keep their prisoners: they gave the Spanish crews ample supplies for a march to Havana. The released men were surprised to hear the admiral personally giving them directions in fluent Spanish; Hein after all was well acquainted with the language as he had been a Spanish prisoner after 1603. The taking of the treasure was the Dutch West India Company's greatest victory in the Caribbean. The money funded the Dutch army for eight months, allowing it to capture the fortress 's-Hertogenbosch, and the shareholders enjoyed a cash dividend of 50% for that year. Hein returned to the Netherlands in 1629, where he was hailed as a hero. Watching the crowds cheering him standing on the balcony of the town hall of Leiden he remarked to the town mayor: "Now they praise me because I gained riches without the least danger; but earlier when I risked my life in full combat they didn't even know I existed." He was the first and last to capture such a large part of a Spanish "silver fleet" from the Americas, these fleets being very well-protected. Plan of the West Indies Company (WIC). One squadron of 12 ships (180 cannons), under the command of Direck Symensz, went the state of Permambuco, in the north-east part of Brazil, and took several sugar ships. A second squadron, also of 12 ships, but larger and more heavily armed, was under the command of Pieter Adriaansz from the city of Vlissingen (Flushing, province Zeeland). His orders were to operate in the waters of the West Indies and attack ships from Honduras and Mexico. These squadrons were nothing compared to the main force of the WIC, consisting of 31 ships (14 of more than 250 tons). Among them were the Amsterdam (625 tons – 22 x 48 pounders and 30 x 25 pounders) and the Hollandsche Thuyn (500 tons), enormous ships for those days. The rest of the fleet had 32 and 42 pounders. All in all, the Dutch West Indies Company had 65 ships in the region. May 22 1628. The big fleet left Texel and sail to Brazil, staying out of the sight of the Portuguese. What admiral Hein didn’t know was that the Spaniards knew about the plans. July 10 1628. A cannon shot was fired when they sighted land. Short after they anchored at St Vincent. Here they put in water and food, except for meat which they couldn't get here. They therefore decided to go to the island Isla Blanca where were a lot of goats. When the fleet left there, they were missing a crewmember. They tried to find the man but did not. They left him behind but this would be a disaster. Shortly after that a privateer ship landed on the island, and found the crewmember sleeping. After interrogating and arresting him, the privateer continued on to La Guayara, where the man was put on a transport to Cartagena. Here he was further interrogated and gave the Spaniards information about the plan to attack their silver fleet from Terra Firma. Piet Hein was lucky that the news had not reached Vera Cruz and the silver fleet from there sailed for Spain.out from there. Meanwhile, the squadron of Pieter Adriaensz, having reached the West Indies, had no problems until it reached the island Grenada, where 16 crewmen lost their lives, being killed by natives while fishing. Later some prizes or bounty ships were taken. 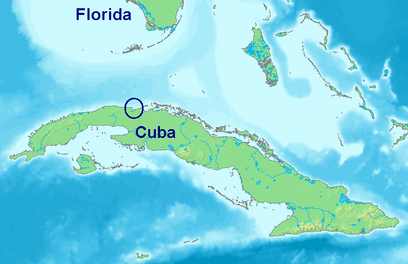 The reconnaissance of the copper harbor of Santiago de Cuba had no result. The squadron cruised the coast of Cuba around Cape Antonio. July 21 1628. The 1628 Spanish silver fleet of Mexico departed early. It contained 30 cargo ships and 5 galleons. The latter under the command of Don Juan de Benevides y Bazan as "Capitan-General" with Don Juan de Leoz as second in command or "Almirante" and Don Francisco Denneboa as commander of the soldiers. Immediately after they left Vera Cruz bad luck began for the fleet. Not far from the coast, they were surprised by a storm coming from the north. The Capitana, the admiral's ship, stranded on a beach and the rest returned confused. Some ships were damaged so they could not continue. July 27 1628. Piet Hein with his 31 ships reached Cap Tiburon in Hispaniola. From there they went to Isla de Pinos. July 31 1628. The squadron of Pieter Adriaensz sighted the Honduras sailors. These large ships seamed to have been warned; they were sailing near the coast, trying in this way to reach the harbor of Havana. They were intercepted by the Leeuwin, the best sailing ship of the Dutch fleet. During this action it ran aground and was heavily damaged by the gunfire of two Spanish ships. Finally both ships were overpowered. One was so heavily damaged that it was decided to put the precious cargo onto the other ship. The Nuestra Señora de los Remedios was set on fire off the coast of Florida. Everything happened very fast because they were waiting for the arrival of the other Spanish ships. All of this was unknown to Piet Hein and he didn't know that the Spaniards know about his presence in the region. August 3 1628. During Piet Hein’s voyage from Cap Tiburon to Isla de Pinos, between both capes they saw 2 sails. They immediately began the pursuit. It seemed to be two Dutch ship that came loose from the fleet. The Rode Leeuw and the Pinas both from the chamber of Amsterdam. It seemed they sailed more to the south than the rest of the convoy. The Roode Leeuw and the Pinas joined the fleet after recovery of the attack by the Dunkerque privateers. August 5 1628. The ships arrived in San Antonio and were keeled. Between august 5th and 10th the ships were cleaned near Cape Antonio. Because the course of the ships of New Spain was more to the north, Piet Hein went to the Tortugas, a group of islands that continue the Keys on the west side of Florida. There they were told by fishermen that the fleet from New Spain from Vera Cruz could arrive at any moment. Due to unforeseen circumstances it would not arrive for three more weeks, but now the Dutch knew for sure that they still had a chance. August 8 1628. The Spanish silver fleet from Mexico left again from Vera Cruz. Their force was reduced to eleven cargo ships and four galleons. The cargo of the ships that were left behind was dispersed under the other ships and also on the war ships. This meant that the warships were packed so full that the guns could just be partly served.August 21 1628. The Dutch fleet met two Spanish ships who thought that they were the fleet from New Spain. When they saw the mistake, skipper Marcus d’Almeida told the Dutch that he had sailed by order of the governor of Havana. He knew nothing of the position of the Spanish, or the Dutch fleet but had to warn them. He was held for 29 days aboard the Dutch fleet. August 22 1628. To verify the new information the ships immediately went to the north coast of Cuba because the Spanish fleet from Terra Firma or the fleet from New Spain were not here. August 24 1628. They arrived at Havana. The castle of El Morro was seen very clearly but it seemed very difficult to sail in that region. The east orientated stream, that goes by the Great Antilles made the ships drift continuously so they lost Havana out of their sight very soon and saw a mountain that, seen from the sea, had the form of a loaf of bread and was called by the Spanish "Pan de Matanzas". While the main force was trying to fight the stream, which was difficult because of the stormy weather, Piet Hein sent out some ships as look-outs.August 27 1628. Around this day they had a council because they were already 14 days overdue to the orders of the “Lords of 19”. They proposed to stop the operation and to sail back to Europe. August 28 1628. Another Spanish ship was sighted. Witte de With asked to attack and obtained permission. The ship with his 50 men crew was overwhelmed. The prisoners were brought to the admiral's ship were they were questioned. This ship was also sent out by the governor of Havana to warn the Spanish fleet. Out of the questioning appeared it that they were coming. So they did not leave for Europe, and thanks to Witte de With the mission would be successful. From the captured prisoners they also heard that the cruising Dutch fleet had been seen by El Morro, that there were 400 to 500 men and 70 guns in the castle. In the two forts in front of the castle were 20 and 28 cannons. So it was the plan to catch the fleet before they could arrive in the strong harbor. There was no danger for this because there were no warships in the harbor of Havana, only a just finished galley and one who was still under construction. Although they were now very sure that the silver fleet could not escape, they didn't know why the fleet was so late. September 2 1628. Piet Hein sent out his fastest ship, De Vos again in the direction of the Tortugas to know something about Banckert, whose fleet was still missing. They were not found there. September 7 1628. In the morning at sunrise sails were seen at the horizon sailing towards the fleet. It seemed to be the squadron of Banckert; Neptunus, De Goude Sonne, De Goude Leeuw, the Dolphijn (dolphin) and the yacht Postpaert. Finally the fleet was complete. September 8 1628. During the night the guard of the Witte Leeuw sighted down under their bow a Spanish merchant ship that was lost from the Spanish silver fleet. He shouted to stay away and the Spaniards answered "Qué queréis". The sloops were immediately manned and the Nuestra Señora de la Concepcion was captured. The captain of the ship was brought to the Dutch commander. When the sun came up, about 20 sails were sighted. nine of which were captured with some difficulty. Afterwards it turned out that, without knowing of the Dutch presence, they followed the shooting of the enemy ships during the night. These seemed to be cargo ships. At a large distance some numbers of big ships were seen. Once they saw the Dutch they went to the coast, trying to reach the bay of Matanzas because Admiral Hendrick Lonck could cut off the way to Havana. The only reachable harbor for the Spaniards was now in the Bay of Matanzas[disambiguation needed]. But these waters were not known to the Spanish steersmen. Meanwhile, there was a race going on. The Dutch did all efforts to overtake the Spaniards. September 9 1628. 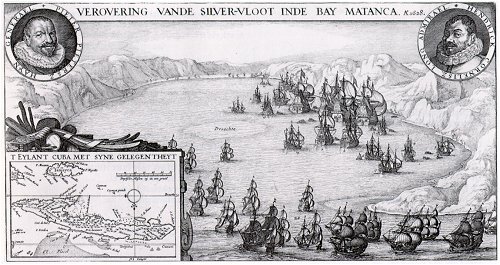 The next morning the Dutch fleet also entered the bay. (There is no agreement in the archives about the time that the Dutch fleet entered the bay of Matanza. Netscher writes “the next day at 9 o clock”, other archives mentioned that Piet Hein was close upon his heels of the Spaniards. Piet Hein was probably not in the possession of good maps of the Cuban coast. Even those of the Spaniards were not accurate because some of their ships stranded on sand banks or other shoal that were not marked on the maps. This made it probable that the Dutch attack happened in the morning. The Spaniards also tried to unload their ships and trying to make an entrenchment on the shore, points into that direction. They wouldn’t have the time if Piet Hein followed them close. The evening before the Dutch tried in vain to cut of the way, although all sails were set and Piet Hein even made them wet to let them catch more wind. The whole Spanish fleet was confused when the Dutch arrived. Some ships were run aground when night fell and were lying in such a way that the available cannons couldn’t reach the entrance of the bay. The Dutch reached the bay in time. Some of their ships also ran aground. 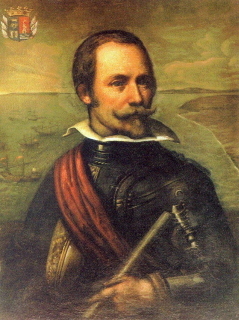 Piet Hein had to act quickly because the Spaniards planned to build a stronghold on land and defend the treasures there. When admiral Hein anchored in the bay, he found already several boats around his ship that were set out by admiral Lonck and vice admiral Banckert to enter the ships. Hein went on board of a sloop of the Hollandsche Thuyn and ordered to go first to the ship of the vice admiral Benavides. The crew of the Spanish ship, who already partially left in panic, shooted some musket fire, but where talked to by the “General”, that is how the Spaniards called Piet Hein. The same was done with the rest of the fleet. During one week they were working transferring the cargo of the captured ships to the Dutch fleet. They had not much confidence in the seaworthiness of the Spanish ships. They hurried up because they feared that the fleet of Terra Firma would showed. But this fleet was lying safely and well in the harbor of Cartagena. When making inventory of the booty, it consisted 177.000 pound silver, some gold (some chains and a crown), skins, chests with sugar, etc. The Spanish galleons were partially unloaded. He took 4 Spanish galleons (Santa Ana Maria, Santa Gertrudis, San Juan Bautista and the Nuestra Señora de la Antigua) and one new smaller ship with the same name. All other ships were burned or sunk on site. The Galleon Nuestra Señora de la Antigua was renamed to Santa Lucia. The smaller ship Nuestra Señora de la Antigua was renamed to Medemblik. September 17 1628. Two hours before sunrise Piet Hein's fleet left the bay on his way back. The governor from Havana sent out two ships to the street of Florida to watch for the Dutch fleet, one in the north and one in the south. It was sent 140 miles west of the Bermudas. It was given to the yachts Ooievaar and Vos. September 26 1628. On his way back admiral Hein wrote the Lords of 19 a letter of the event. It is dated September 26 1628. September 30 1628. The Spanish ships signalled Piet Hein's fleet passing the passage of Florida. October 25 1628. During the night the Santa Gertrudis lost his foremast and the stem of the ship. October 31 1628. After installing a new mast she was seen the 31st for the last time. In a short time the admiral had left only 14 ships. Afterwards some ships rejoined the convoy. November 14 1628. The Ooievaar arrived in Rotterdam with the news of the captured fleet. Due to many storms the master fleet it was very hard. December 4 1628. Further they lost a lot of men by scurvy. The main fleet arrived at the island Wight were the met Jan Evertsen with 3 warships. The Santa Gertudis, full with sick men, arrived in the harbor of Falmouth in sinking condition and was sold there for 200 pound. Spanish ship list (21). Santa Ana Maria - Admiral Juan de Benavides y Bazan stranded on the south-east coast of Ireland. The captain Pieter Franz knew to save the crew and guns.Santa Gertrudis - Baltasar de Amezquita. Arrived sinking in England and was sold.San Juan Bautista - Alonso de Ayspuru. Called "Platluys" due to the insects on board. Was put on fire in full sea.Santa Lucia de van Guerra. Arrived as troffe on the Schelde. It was renamed "Middelburg" and served for some years.Nuestra Señora de la Antigua - Francisco Ortuno, Nuestra Señora de la Concepcion, Nuestra Señora de la Antigua (new ship), unknown yet, The San Juan Bautista was declared as lost and was destroyed on the way back.The Santa Ana Maria sank on the way back home before the Irish coast. 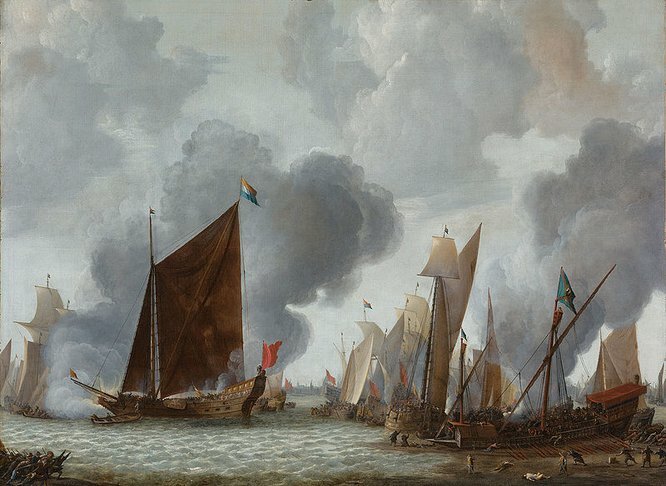 The naval Battle of the Slaak (12 and 13 September 1631) was a Dutch victory. The Dutch prevented the Spanish army from dividing the Dutch United Provinces in two. In reaction to an overland Dutch attempt to capture Dunkirk earlier in the year, Infanta Isabella Clara Eugenia of Spain, governing the Southern Netherlands for Philip IV of Spain, ordered a Spanish army transported on a fleet of barges to attempt to occupy the islands of Goeree and Overflakee by surprise. In particular, the Spanish wished to overpower the large fortresses on either side of the Volkerak Strait. The fortress on the continental side had special propaganda value, as it was a newly founded town named Willemstad after William the Silent; more importantly, Spanish occupation would have allowed a blockade of the Dutch main naval port Hellevoetsluis located to the direct north of Overflakee on the island of Voorne; and the isolation of the province of Zealand from its confederate provinces. A Spanish fleet of ninety vessels and 5,500 men under the direction of Don Francisco de Moncada, Marquis of Aytona, but in fact commanded by Count Jan van Nassau Siegen, a catholic cousin of the Calvinist Dutch House of Orange, mostly consisting of small transports, departed from Antwerp. The project could not be kept a secret however and a Dutch task force of fifty ships, also largely consisting of small rivercraft but containing some larger flyboats, under Zealandic Vice-Admiral Marinus Hollare, intercepted the fleet in the Eastern Scheldt. Seeing their intended route blocked, the Spanish first tried to capture the more southern island of Tholen instead, to show something for their efforts, but this attempt was thwarted by a regiment of two thousand English and Scots mercenaries under the command of Colonel Thomas Morgan from the continental fortress of Steenbergen who marched at low tide through the shallow sea to the island, arriving just in time to deter a landing. Van Nassau in his desperation then took the bold decision to attempt to sneak past the Dutch fleet during the night and so achieve the original goal after all. The Spanish movement however was noticed despite a fog; despite their small number the Dutch first allowed the enemy fleet to pass completely before cutting them off. Once this was achieved the Dutch suddenly attacked the Spanish from behind in the Slaak of Volkerak channel and were routed. Hundreds drowned as they tried to escape the ships and those that did escape were captured by the waiting Dutch and English troops ashore. Over 4,000 troops and seamen were captured along with the majority of ships. Van Nassau himself and two ships accompanying him managed to escape to Antwerp; it is not exactly known how many others escaped, perhaps as much as a third of his fleet. The Admiralty of Amsterdam suggested throwing all prisoners into the sea — until that time the officially prescribed method for the Dutch to dispense with enemy combatants captured at sea — to deter further attempts, but stadtholder Frederick Henry of Orange forbade this. 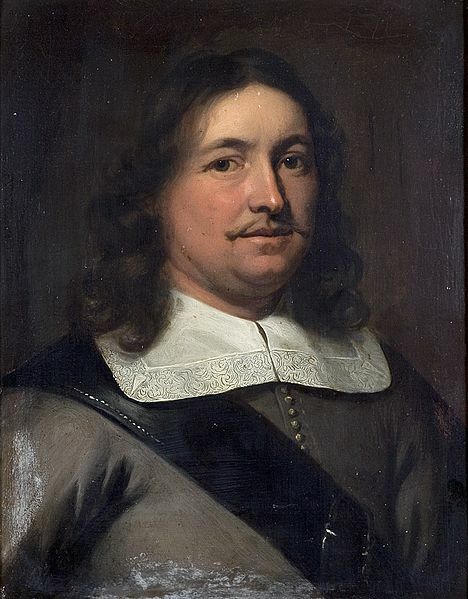 One of the captains distinguishing himself was the later Lieutenant-Admiral Johan Evertsen, his brother the later Lieutenant-Admiral Cornelis Evertsen de Oude also participated. The defeat was one out of a series of setbacks for the Habsburg policy in the Thirty Years War waged the same time in the larger German theatre; it influenced a decision in 1632 to reach a peace settlement between the Habsburgs and the Republic — the peace talks were unsuccessful however. 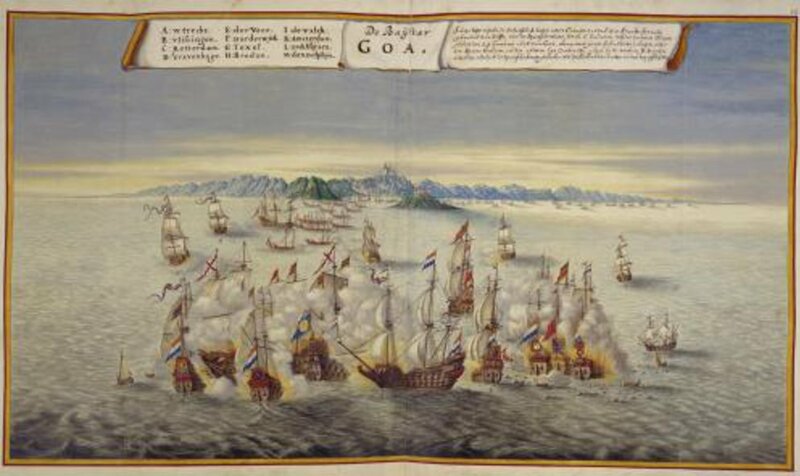 The Battle of Goa was a naval engagement between the Portuguese forces commanded by the Viceroy of Portuguese India, D. Pedro da Silva, and a large Dutch fleet sent to block Goa. While the Portuguese were commanded by Pedro da Silva and António Teles de Meneses, the Dutch were led by Admiral Adam Westerwolt, who was badly defeated at this encounter. 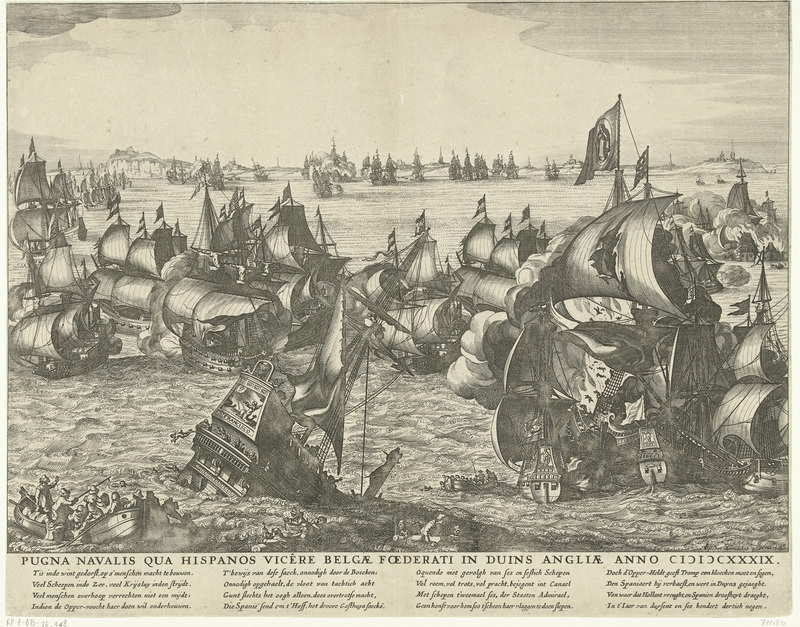 The naval Battle of the Downs took place on 21 October 1639 (New Style), during the Eighty Years' War, and was a decisive defeat of the Spanish, commanded by Admiral Antonio de Oquendo, by the United Provinces, commanded by Lieutenant-Admiral Maarten Tromp. The entry (in 1635) of France into the Thirty Years War had blocked off the overland "Spanish Road" to Flanders. To support the Spanish army of Flanders of Cardinal-Infante Ferdinand, the Spanish navy had to ferry supplies by sea via Dunkirk, the last Spanish-controlled port on the North Sea coast. A Spanish fleet, under admiral Lope de Hoces y Córdova, had managed to make the trip to Dunkirk in 1636 and again in 1637, without being spotted by Dutch squadrons. In 1638, the French invaded Spain, and laid siege to Fuentarrabia. Lope de Hoces was hurriedly dispatched to rescue the city, but his fleet was destroyed by the French navy under Henri de Sourdis while it lay at anchor near Getaria. As the remainder of the Spanish navy was engaged on missions in the Mediterranean and Brazil, there were not enough ships left to attempt the Dunkirk passage that year. In the spring of 1639, the Count-Duke of Olivares ordered the construction and assembly of a new fleet at A Coruña for a new relief jaunt to Dunkirk. 29 warships were assembled in four squadrons, soon joined by an additional 22 warships (also in four squadrons) from the Spanish Mediterranean fleet. Twelve English transport ships also arrived, contracted to carry the Spanish army under the flag of English neutrality. Lope de Hoces was offered overall command, but he turned it down. As a result the command passed to Antonio de Oquendo, commander of the Mediterranean fleet. Oquendo was under instructions to assume a half-moon formation, to induce the Dutch into a boarding battle. The flagship was placed on the right wing (rather than the center), as that is where it was expected the Dutch firepower would come from. In a curious decision, ships of different squadrons were mixed through the formation, an attempt to ensure that the smaller ships would be supported by larger ones. The vanguard was to be composed of the seven-ship "Dunkirk squadron" commanded by Miguel de Horna, in light of their experience with the channel. The Dutch States-General made their own preparations. From intelligence networks, the Dutch learned that the Spanish fleet might attempt to make for the anchorage known as The Downs, off the English coast, between Dover and Deal. There they could anchor under protection of English neutrality and ferry the army and supplies on smaller, fast boats across the English Channel to Dunkirk. The States-General ordered a fleet of 23 warships and some fireships, under the overall command of Maarten Tromp, into the channel to prevent this eventuality, while the rest of the Dutch fleet was still being prepared. Tromp was under instructions to watch for and, if necessary, harass and delay the Spanish fleet, but was forbidden from engaging them in battle until the rest of the Dutch fleet, some fifty vessels under Johan Evertsen, had been launched and joined them. Setting out, Tromp divided his fleet into three squadrons. One squadron of fifteen ships, under rear admiral Joost Banckert, was dispatched to a position above the Downs, in case the Spanish fleet had circumvented the British Isles and was coming from that side, and a second squadron of six ships under Witte de With was put inside the English Channel, on patrol by the English coast, while Tromp himself took the remaining 12 ships to patrol the French side of the channel. The Spanish fleet of 75 ships and 24,000 soldiers and sailors set out on 27 August from A Coruña (in another calculation, 51 galleons, with the troops carried aboard 7 pataches and 12 English transports; on the whole, an estimated 8,000 sailors and 8,000 troops). The fleet reached the mouth of the English Channel on September 11. On September 15, they learned from a passing English ship that a Dutch squadron was anchored near Calais. On the morning of September 16, the Spanish fleet spotted the 12-ship squadron of Maarten Tromp near the French coast. Tromp immediately dispatched one of his ships to warn Banckert, leaving him with only 11. De With's squadron were visible at a distance, but too late to reach Tromp. With odds of 57 against 11, Oquedo could probably have made for Dunkirk directly, and there would have been little Tromp could to do stop it. But Oquedo could not resist the chance to make battle with such favorable odds. 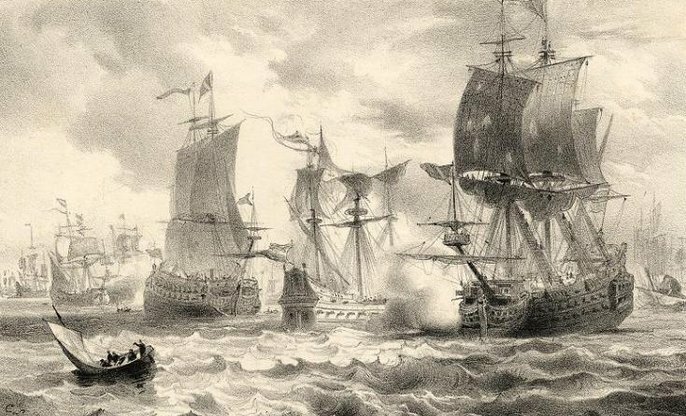 Perhaps not realizing the size of the Spanish fleet, Tromp did not decline battle but rather ordered his squadron into a tight line of battle. Believing Tromp's squad was attempting to slip past his right wing, Oquendo impetuously ordered his flagship to turn hard to starboard, hoping to board Tromp's flagship. This maneouver, however, was effected without warning the rest of the Spanish fleet. Some of the ships near Oquendo turned with him, others were confused and maintained bearing. The half-moon formation quickly disintegrated, and only the Dunkirk squadron and the galleon San Juan kept up with the Spanish flagship's pursuit of Tromp.Had Oquendo given the order for a line, the immense Spanish fleet could have probably encircled and dispatched the Dutch squadron in a few hours. But Oquendo seemed intent on boarding the Dutch flagship. When he finally decided to turn for a shot, he did it too late and sailed past the Tromp's poop. Trying to correct his error, Oquendo attempted to board the second ship in the Dutch column. The latter also avoided him. Oquendo's flagship and one of the Dunkirk ships, the Santiago, were now downwind and on the receiving end of the cannonades of the remaining nine ships of the Dutch column. Tromp turned his column and went for another round on the Santiago. Oquendo, the other six Dunkirk ships and the San Juan, unable to turn upwind, fired as they could. The artillery did little damage, but Spanish musketry picked off many on the Dutch decks. This encounter lasted for three hours, in the course of which the Dutch ship Groot Christoffel accidentally exploded. By noon, the six ships of the De With column had reached Tromp, and increased his number to 16. Although the rest of the Spanish fleet remained dispersed and disorganized, many units had finally turned and were also approaching from the other side. For Tromp, this was building up into a dangerous situation, as the Spanish units upwind would cut off his exit, and force the Dutch squadron to turn into the shoals of the bay of Boulogne and almost certainly run aground. But at this moment, Oquendo ordered the Spanish fleet to resume a half-moon formation. The Spanish ships turned, allowing Tromp's squadron to turn also, gain the wind, and escape the danger. There were no more engagements that evening. 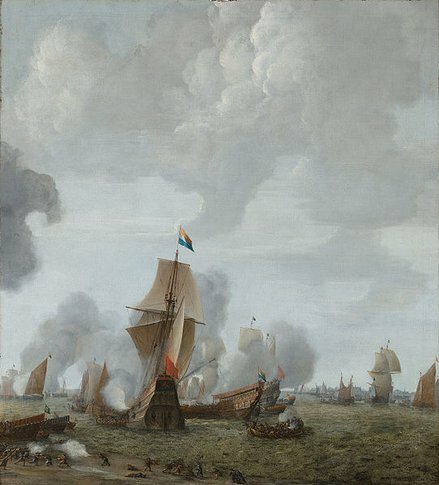 The fleets anchored in, and the next day, rear-admiral Joost Banckert arrived, bringing the total Dutch fleet to thirty-two. But there was no engagement, just preparations for what was to become known as the Action of 18 September 1639. The Spanish, whose priority was to protect the troops, not to endanger them by continuing the battle, were driven to take refuge off the coast of England, in the anchorage known as The Downs between Dover and Deal, near an English squadron commanded by Vice-Admiral John Pennington. They hoped the usual autumn storms would soon disperse the Dutch fleet. Tromp, as always, endured De With's insubordination with complacency. In a famous scene, described by De With himself, he entered Tromp's cabin after the battle with his face sooty, his clothes torn, and limping from a leg wound. Tromp looked up from his desk and asked: "Are you alright, De With?" De With replied: "What do you think? Would I have been if you had come to help me?" On the evening of the 28th, Tromp and De With withdrew to resupply, as they were short on gunpowder. They feared they had failed in their mission until they rediscovered the Spanish at the Downs on the 30th. Together, they blockaded the Spanish and sent urgently to the Netherlands for reinforcements. The five Dutch admiralties hired any large armed merchant ship they could find. Many joined voluntarily, hoping for a rich bounty. By the end of October, Tromp had 95 ships and 12 fire ships. Meanwhile, the Spanish, who earlier had managed to sneak 13 or 14 Dunkirker frigates through the blockade, began to transport their troops and money to Flanders on British ships under an English flag. Tromp stopped this by searching the English vessels and detaining any Spanish troops he found. Uneasy about the possible English reaction to this, he pretended to Pennington to be worried by his secret orders from the States-General. He showed him, "confidentially", a missive commanding him to attack the Spanish armada wherever it might be located and to prevent by force of arms any interference by a third power. Legend also says that Tromp formally asked de Oquendo why he refused battle though he had superior firepower. De Oquendo replied that his fleet had to be repaired first, but that he could not obtain masts and other materials now that the Dutch blockaded him. On learning this, Tromp supplied the Spanish with the necessary materials for repair. Nevertheless they did not leave the English coast. Before the Battle of the Downs by Reinier Nooms, circa 1639, depicting the Dutch blockade off the English coast, the vessel shown is the Aemilia, Tromp's flagship. On 31 October, an easterly wind giving him the weather gage, Tromp having dispatched 30 ships under De With to watch the English and prevent them from interfering, kept two squadrons to the north (under Cornelis Jol) and the south (under Commodore Jan Hendriksz de Nijs) to block escape routes and attacked with three squadrons. Some of the large, unmanoeuverable Spanish ships panicked on approach of the Dutch fleet and grounded themselves deliberately; they were immediately plundered by the English populace, present in great numbers to watch the uncommon spectacle. Others tried a planned breakthrough. De Oquendo's Royal Flagship, the Santiago, came out first followed by the Santa Teresa, the Portuguese flagship. Five blazing fireships were sent into the Spanish ships. The first Spanish ship could disengage and avoid three of the fireships at the last moment, but these hit the following Santa Teresa, who had just managed to repel the attack of the other two. Too big (the biggest ship in the Spanish/Portuguese fleet) and slow to manoeuvre, and with no time to react, the Santa Teresa was finally grappled and set on fire by one fire ship. With Admiral Lope de Hoces already dead from his wounds, she fiercely burned with great loss of life. The Portuguese ships were intercepted by the squadron of the Zeelandic Vice-Admiral Johan Evertsen who launched his fireships against them: most were taken or destroyed, leaving according to some reports 15,200 dead and 1,800 prisoner. The number of dead is today considered as greatly exaggerated; for example, it does not take into account that a third of the troops had already reached Flanders. De Oquendo managed to escape in the fog with about ten ships, most of them Dunkirkers, and reach Dunkirk. Nine of the ships driven ashore during the battle could be later refloated and also reached Dunkirk. According to the Spanish naval historian Cesáreo Fernández Duro, of the 38 ships that attempted to break the Dutch blockade, twelve ran aground on the Downs (of which nine were refloated and managed to reach Dunkirk), one was burnt by a Dutch fireship, nine surrendered (of which three were so damaged that they sank on the way to port) and three ran aground on the coasts of France or Flanders to avoid capture. The French diplomat Comte d'Estrades, in a letter to Cardinal Richelieu, claimed that the Spanish had lost thirteen ships burnt or sunk, sixteen captured with 4,000 prisoners, and lost fourteen off the coasts of France and Flanders, a figure higher than the number of Spanish ships present at the Downs. D'Estrades also reported in his letter that the Dutch had lost ten ships sunk or burnt. This source is cited by Jean Le Clerc in his Histoire des Provinces-Unies des Pays-Bas. The Portuguese Admiral and historian Ignacio Costa Quintella gives figures of 43 ships and 6,000 men lost by the Spanish and some ships and more than 1,000 men by the Dutch. The Dutch sources only mention the loss of one Dutch ship that got entangled with the Santa Teresa and about a hundred persons dead. Historian M.G de Boer's extensively researched book about the subject confirms this and puts Spanish losses in ships and men at about 40 and 7000 respectively. 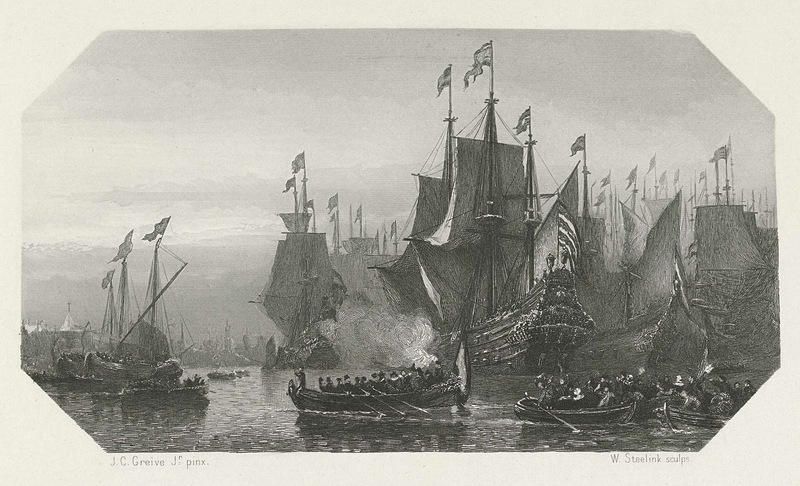 The celebrated Dutch victory marked a significant moment in the shifting balance of naval power. Even if the Spanish mission was a failure, the larger part of the infantry troops managed to reach Flanders with all the money. Of the ships that succeeded in breaking through the blockade, many were severely damaged. Spain, straining under the vast commitments of the Thirty Years war, was in no position to rebuild its naval dominance. Fighting over trade continued between Dutch and Dunkirker forces and the convoy itself was just one of a number; but these convoys paid a heavy price in lives and ships in running the Dutch blockades. These complicated operations in the Low Countries had left the overall Spanish Habsburg forces and finances in a precarious situation. The Dutch, English and French were quick to take advantage by seizing some small Spanish island possessions in the Caribbean. But by far the worst effects for Spain were the increased difficulties it suffered in maintaining its position in the Southern Netherlands. Tromp was hailed as a hero on his return and was rewarded with 10,000 guldens, invoking the jealousy of De With who only got 1,000. De With wrote some anonymous pamphlets painting Tromp as avaricious and himself as the real hero of the battle. With Spain gradually losing its dominant naval position, England weak, and France not yet in possession of a strong navy, the Dutch allowed their own navy to diminish greatly after a peace treaty was signed in 1648. So, with an ineffective naval administration and ships that were too light and too few in number, they were to find themselves at a serious disadvantage in their coming struggles with the English. However, they were able to maintain their large mercantile advantage over the English, entering into a period of increasing Dutch maritime superiority, both mercantile and naval, from the Second Anglo-Dutch War, until the onset of the 18th century. The Battle of the Downs was a flagrant violation of English neutrality within sight of the English coast. For the English, their navy's inability to intervene was a humiliation. Lingering resentment from this incident may have influenced the breakout of the First Anglo-Dutch War, not far from the Downs at the Battle of Goodwin Sands in 1652. San Antonio (pinnace) (Masibradi) - Driven ashore 31 October, San Agustin (pinnace) (Martin Ladron de Guevara) - Driven ashore 31 October, Santa Teresa 60 (Portugal) - Don Lope de Hoces, commander. Destroyed in action 31 October, San Jeronimo, San Agustin (Naples) - Vice-Admiral. Driven ashore 31 October, sunk 3 or 4 days later, El Gran Alejandro (Martin Ladron de Guevara) - Taken by the Dutch, Santa Ana (Portugal), San Sebastian, Santa Catalina (Guipuzcoa) - Driven ashore 31 October, San Lazaro, San Blas (Masibradi) - Driven ashore 31 October, San Jerónimo (Masibradi) - Burnt in the Downs 31 October, San Nicolas, Santiago (Castile) - Burnt off Dover on the night of 2 November, San Juan Bautista (Guipuzcoa) - Sunk 31 October, Esquevel 16 (hired Dane) - Captured 28 September, San Jose (Dunkirk), Los Angeles (Castile) - Driven ashore 31 October, Santiago (Portugal) - Driven ashore 31 October, Delfin Dorado (Naples) - Driven ashore 31 October, San Antonio (Naples) - Driven ashore 31 October, San Juan Evangelista (Dunkirk), El Pingue (hired ship) - Sunk in the Downs 31 October, San Carlos (Masibradi), San Nicolas (Masibradi), San Miguel, Orfeo 44 (Naples) - Lost on the Goodwin sands 31 October, San Vicente Ferrer (Dunkerque), San Martin (Dunkerque), Nuestra Senora de Monteagudo (Dunkerque) - Escaped into Dunkirk 1 November, Santiago 60? (Galicia) - Captured 31 October, ? (flag of Masibradi) - Captured 28 September, retaken same day, escaped to Dunkirk, 1 November, wrecked 4 days later, Santo Tomas (Martin Ladron de Guevara) - Driven ashore 31 October, Nuestra Senora de Luz, Santa Clara, San Gedeon (Dunkerque), San Jacinto, San Carlos (Dunkerque) - Sunk 31 October, Santo Cristo de Burgos (San Josef) - Lost off the French coast 31 October, San Paulo (Masibradi), San Miguel, La Corona (hired ship), La Presa or San Pablo La Presa (Castile), San Esteban (Martin Ladron de Guevara) - Captured 31 October, San Pedro de la Fortuna (hired ship) - Driven ashore but got off, 31 October, Los Angeles (hired ship), Aguila Imperial, La Mujer, Santo Domingo de Polonia (hired Polish ship) - Driven ashore 31 October, San Jose (flagship of Vizcaya) - Captured 31 October, San Salvador (flagship of Dunkirk) - Escaped into Dunkirk 1 November, São Baltasar (Vice-Admiral of Portugal) - 800 tons. Back at Lisbon in 1640, San Francisco 50? (Rear-Admiral of Dunkerque) - Escaped into Dunkirk 1 November, San Pedro el Grande (flagship of Ladron de Guevara), Santiago (Martin Ladron de Guevara), Jesus Maria (pinnace), San Pedro Martir (urca) (hired ship) - Driven ashore 31 October, Fama (Urca) (hired ship) - Driven ashore 31 October, Santa Cruz (Masibradi), San Daniel (Guipuzcoa) - Driven ashore 31 October, San Juan Evangelista (hired ship of Hamburg) - Driven ashore 31 October, Santa Agnes (frigate) (Naples) - Stranded but got off, 3 November, Grune? (Castile) - Driven ashore, 31 October 1639, Santa Teresa (Saetia) (Castile) - Taken by a French privateer 31 October, Exchange (hired English transport) - All 8 English transports put into Plymouth 13 September, and reached the Downs 22 October, where they were detained, Peregrine (hired English transport), Assurance (hired English transport), 5 other hired English transports. The Action of 12–17 January 1640 was a naval battle between a Dutch fleet and a combined Spanish-Portuguese fleet during the Eighty Years' War. The battle took place on the Brazilian coast off Pernambuco and was an attempt by a fleet consisting of approximately eighty vessels transporting about 5,000 soldiers under the command of Portuguese Admiral Fernando de Mascarenhas to land reinforcements to bolster the Portuguese militia besieging the city of Recife. On 12 January this fleet was intercepted by a Dutch task force of about forty ships commanded by Willem Loos. The ensuing battle lasted with occasional breaks until the evening of 17 January, when the Spanish and Portuguese fleet retreated and sailed away to the north.About 30 Spanish and Portuguese vessels under Admiral don Lope de Hoces arrived off the Dutch Brazil in November 1635. Although the fleet failed to overran Pernambuco, supplies and 2,500 Spanish, Portuguese, and Neapolitan reinforcements were successfully landed at the Lagunas under General Luis de Rojas. The Dutch vessels in the area were driven off and De Hoces spent some months escorting a sugar convoy to the Spanish Main and preparing a counter-invasion the to Dutch-held island of Curaçao which was finally abandoned because the siege train was lost in a wreck. The expedition was seen as success in Spain, however, because the landed troops greatly contributed to defeat John Maurits of Nassau's attack over Bahia. Another expedition was planned at Hoces'a arrivel to retake the Dutch base of Pernambuco. 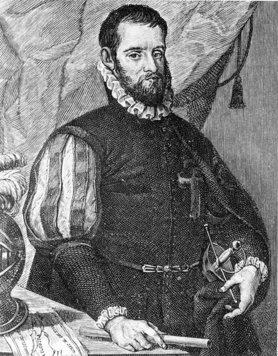 The command of this expedition would be entrusted to Miguel de Noronha, 4th Count of Linhares, for which he was appointed Capitán General del Mar Océano, but he eventually declined to lead the fleet as he did not trust in the success of the expedition. García Álvarez de Toledo, 6th Marquis of Villafranca also rejected its command, but not the Count of Torre, Dom Fernando de Mascarenhas, former Portuguese governor of Tangier. The same day that the French siege of Hondarribia was lifted, he was given the command of 41 ships, of which 23 were Portuguese and were commanded by Admiral Dom Francisco Melo de Castro and Vice Adm. Dom Cosme Couto de Barbosa, and 18 were Castilian under Admiral Juan de la Vega y Bazán and Vice Adm. Francisco Díaz de Pimienta. 5,000 soldiers of infantry were embarked aboard this ships. Half of them were of the Tercio de Anfibios, a unit specialized in the naval fighting. The fleet stopped at the islands of Cape Verde, where an epidemic struck the crews of the ships, resulting in the death of 3,000 men and a number plus larger of incapacitated at the arrival of the fleet to Salvador da Bahia. Mascarenhas, ignoring his orders for an immediate assault upon Recife, spent about a year in the town before set sail again, which was done on January 1640 with the intention of land 1,200 soldiers under Luís Barbalho Bezerra to reinforce the Portuguese guerrilla surrounding the Dutch garrison of Pernambuco. 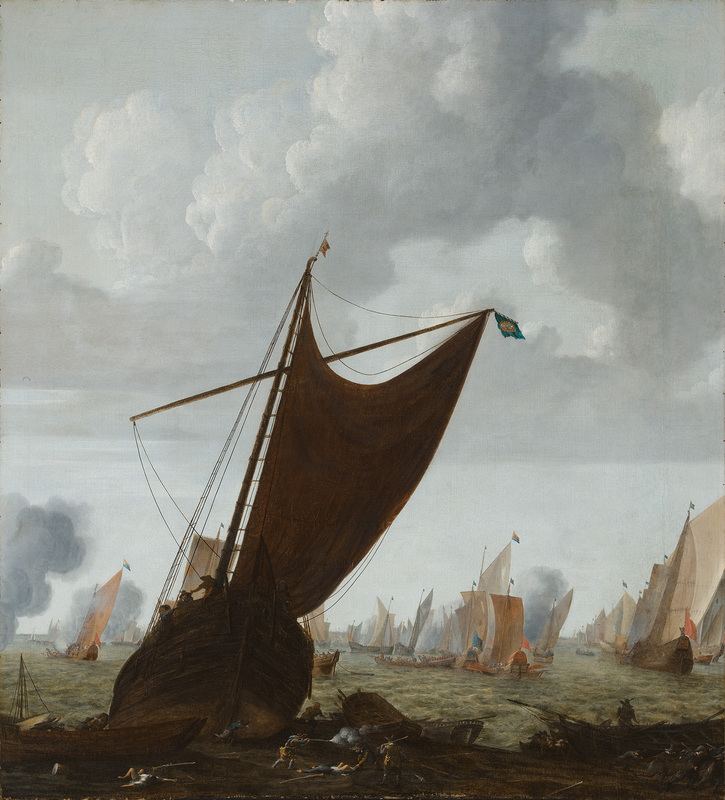 A Dutch fleet of 36 ships under Admiral Willem Corneliszoon Loos and Vice Adm. Jacob Huygens emerged from Recife and intercepted the Spanish-Portuguese fleet between Itamaracá and Goiana on 12 January, before any attempt of disembarkation could be effected. The battle degenerated in a confused melee in which Loos lost 2 of his vessels,while Loos himself was killed aboard his flagship, while confronting Mascarenhas flagship. Some Dutch ships managed to approach and disengage it from the Spanish flagship, but the vessel sank, taking down the admiral. Another Dutch ship, the Alemar, was riddled by the Spanish guns and nearly sank, being unable to continue the pursuit. Vice Adm. Huygens,now aboard Loos' former flagship the Faam, continued the chase and the action was resumed the following day between Goiana and Cabo Branco. The Dutch fought a long-range battle using their superior artillery, but the only ship lost that day was the Dutch Soleil Brillant, badly damaged and sank with its commander and 44 soldiers. On 14 January Huygens renewed the attack off Paraíba. The Portuguese galleon of Capt. António da Cunha Andrade was captured, and another Spanish vessel of the Squadron of Castile ran aground and was boarded while fighting the Dutch Zwaan. Its crew under the Neapolitan Colonel Héctor della Calce was taken prisoner. The Dutch Zwaan, under Rear Admiral Aldrichsz, lost its mainmast and, washed away, ran aground on the coast. Compelled to sail northwest, the Spanish-Portuguese fleet arrived before Rio Grande closely followed by the Dutch. The lack of wind prevented both fleets from attack each other until 17 January. That day the Dutch won the winward and attacked the Spanish-Portuguese. Mascarenhas ship was damaged, after which the Dutch fleet abandoned the pursuit and the Spanish-Portuguese vessels could land the army at Cape São Roque, too far to threaten Recife. Although the battle had been largely indecisive, the Dutch objective of impede the Spanish disembarkation near Recife was accomplished.The behavior of three captains in the battle, nevertheless, displeased the Count of Nassau, who condemned them to death "for not fulfilling his military duties in front of the galleons of Spain". Mascarenhas was also punished, being arrested upon his arrival on Spain. The Dutch garrison of Recife was increased in March 1640 by 2,500 soldiers carried aboard 28 ships under Amidrals Cornelis Jol and Jan Lichthart, who was in charge of naval operations to disrupt the Portuguese sugar trade. In December Portugal revolted against the Spanish Habsburg rule, proclaiming the seventh Duke of Bragança as King João IV in place of Philip IV of Spain. Although the Dutch welcomed the news of the revolt, expecting the Portuguese to become their allies, this did not happen, as the Dutch had no wish to restore the occupied territories to Portugal. Recife served as base for an expedition under Jol and Lichthart, in 1641, to seize Portugal's slaving depots in Angola before any treaty could be concluded in Europe, and despite a ten-year truce between both countries was signed in 12 June, the hostilities continued, resulting in the expulsion of the Dutch from Brazil in 1654. The Battle place on 10 June 1647 during the Eighty Years' War between a Spanish fleet and a Dutch fleet in Puerto de Cavite, an important Spanish port in Manila Bay, Philippines in which the Dutch were defeated. 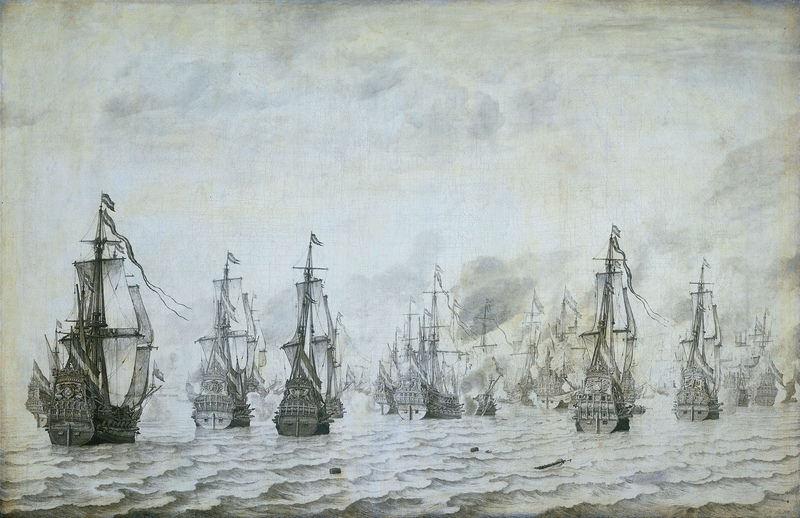 Twelve Dutch ships besieged Puerto de Cavite, the home of the Manila galleons, on June 10. The Spaniards and Filipinos defended the port with artillery fire and sank the Dutch flagship. Subsequently the Dutch left with the Spaniards and Filipinos still maintaining control over the port. This came at a great cost since Porta Vaga, a Spanish stone fort that defended the area, was destroyed. The Dutch then went on to harass the Manila Bay area until the war's end in 1648 with the Treaty of Münster. The port, Puerto de Cavite, was one of many important Spanish naval possessions in Manila Bay in the Captaincy General of the Philippines, and facilitated the Manila galleons trade between the Philippines and New Spain (present day Mexico). Puerto de Cavite is located in present day Cavite City.